The Grampians is a stunning region for those who love the best things in life - good food, great wine and the beautiful outdoors. Gastrology recently had the opportunity to spend a weekend away exploring the Grampians thanks to Visit Grampians. Eurambeen Homestead is a tranquil home away from home. Owners Sarah Beaumont and Ian Glover moved to the area in 2012 and began an arduous renovation process with great diligence and love. Today, the historic homestead is absolutely beautiful with the couple being recognised as the best New Business for the region in 2016. We loved staying in the Homestead’s Mrs Beggs Apartment. The spacious original 1920’s private apartment of Mrs Agnes Beggs is located within the main Eurambeen homestead. It is beautifully appointed and reflects the charm and characteristics of the era. The apartment boasts a private entrance, a very grand master bedroom, ensuite bathroom and a wood fire perfect for the cooler months. Waking up in Eurambeen is a wonderful treat - the sound of birds chirping fill the air as warm light trickles through the wide windows overlooking the sweeping lawn. We enjoyed a slow breakfast of the generous provisions provided. Our first stop of the day was iconic Grampians winery, Best’s where we enjoyed meeting Hamish Thomson for an underground tour and tasting. Hamish, like all of his family, has been involved in his family's winery since he was a little boy. We loved hearing about the winery’s rich history and their passion for producing great wine that captures the essence of the region. Best's winemaking philosophy is that great wines are made in the vineyard. As such, care is taken at every step with the greatest attention to detail. This great care and attention shone through in the tasting, our favourite part obviously! We couldn’t resist going home with a bottle of their iconic Bin No. 0 Shiraz! If you’re in the Great Western area, we suggest you treat yourself to a stunning lunch at Steel Cutters Cottage. Housed within a refurbished metal smith’s cottage, the eatery boasts luscious green landscaped gardens, perfect to indulge in the local wine selection and beautiful artisan produce on offer. The menu consists of both larger and smaller sharing plates – think fresh produce, cooked to perfection and bursting with flavour. Whatever you do, do not leave without trying their beautiful range of French Terrines, Pâtés and Rillettes which are entirely handmade in the Steel Cutters Cottage Kitchen in Great Western. You can thank us later. Mount Langi Ghiran Winery is known for producing outstanding, elegant wines but the winery is worth a visit for its fabulous views alone. We loved being taken on a quick tasting before heading off to discover Mount Langi’s Picnic Idyll offer. Set amongst the breathtaking vineyard, this is definitely one romantic way to laze away the afternoon. All you need to do is bring along your picnic feast, select your favourite wine by the glass or the bottle and for a $10 fee Mount Langi Ghiran provides you with all the picnic accessories needed – including Plumm Outdoors wine glasses which you can take home with you. Located in the heart of Great Western, the Great Western Hotel is a local favourite – and it is easy to understand why. The eatery is owned by the Ahchow family and proudly boasts the largest Grampians Regional Wine List, all available by the glass and the bottle and all bottles are $35! We loved the fact that a lot of wine producers that do not have cellar doors are featured which makes it the perfect destination to enjoy and discover wines from the region. Given the generously sized wine list, if in doubt, make sure you ask for a recommendation – the Ahchow Family are amazing hosts and will make sure you are on the right track. The food menu is wonderfully unpretentious – expect to see all your pub favourites. The steaks are of particular note – juicy and cooked to your liking and most importantly, perfect to wash down with that bottle of red you just ordered. Livefast Lifestyle Café is a vibrant café with a relaxed atmosphere. Known for serving the best coffee in town, the café has a delicious food menu to match. The kitchen proudly sources local produce wherever possible. We loved starting our day at Livefast. The café’s rendition of the humble smashed avo was a winner. Think luxurious minted smashed avocado adorned with goat’s cheese, fresh fig, dukkah, fresh rocket, chilli and pomegranate, sitting atop crusty seeded sourdough. The vegetarian option of lemongrass, chilli and turmeric tofu scramble was similarly delightful. The addition of earthy shiitaki mushrooms added texture and worked wonders flavour wise. A visit to Halls Gap would be incomplete without a little sigh-seeing to enjoy the stunning views and spot some of the inquisitive wildlife. Boroka Lookout provides panoramic views over Halls Gap and the east of the Grampians. The lookout is located 15km from Halls Gap making it easily accessible for those with limited time. It is only a short stroll to two viewing platforms and is suitable for people with limited mobility. One of the largest waterfalls in Victoria MacKenzie Falls is a must-see and flows all year round. At Reed Lookout, visitors can enjoy stunning views over the entire Victoria Valley, Victoria Range, Serra Range, Lake Wartook and the Mt Difficult Range. Harvest Halls Gap is a cafe, provedore and accommodation business that heroes the Grampians’ amazing local produce. Our top picks from the brunch menu include the hearty and nutrient dense breakfast super salad which is an exciting amalgamation of housemade hummus, chopped avocado, fresh tomato, rocket, roasted mushrooms, toasted pumpkin seeds and two poached eggs. We recommend you add on the optional Salt Kitchen chorizo to the dish. It’s very very delicious. Another winner on the menu is the Banh Xeo. Meaning “sizzling cake” in Vietnamese, this is a really yummy combo of crispy turmeric crepes filled with luscious chargrilled pork, chicken as well as fresh beansprouts and herbs. Montara’s exceedingly charming colonial style cellar door is an unmissable stop in Ararat. We suggest you choose your favourite drop from the tasting at the cellar door and then relax with a glass (or bottle!) of your favourite drop together with a cheese platter and enjoy the picturesque landscape. 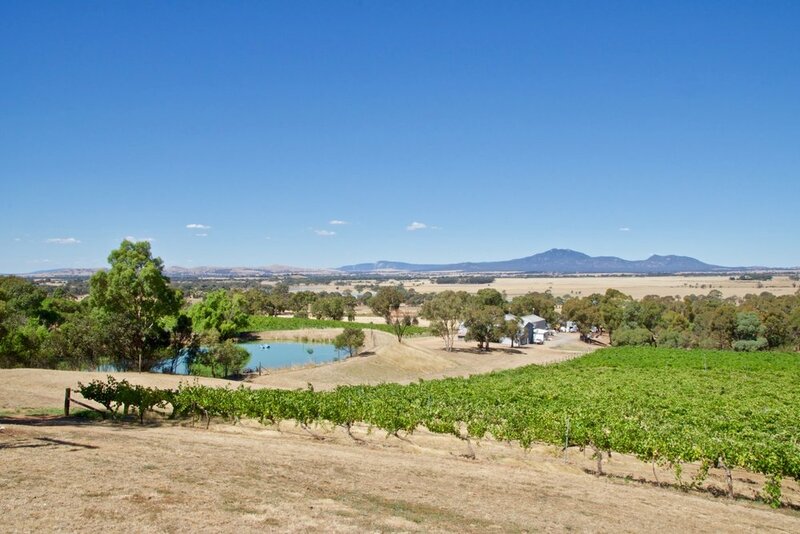 Definitely some of the very best cellar door views available.